Join this presentation and discover the latest developments in artificial intelligence. 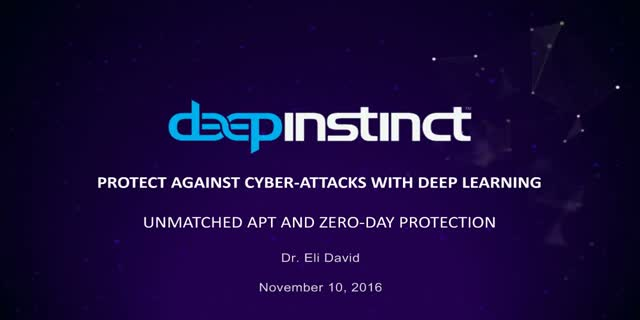 Dr. David, CTO of Deep Instinct, will explain deep learning and how it can help protect your organization against cyber attacks. The session will include a demo of deep learning’s first application to cybersecurity, showcasing the highest accuracy rates in detecting zero-day and APT attacks, offering real-time, proactive protection. The term “virus” exists both in biology and in computers, but how deep are the similarities and differences between biological viruses and computer malware? The life cycle of biological viruses, which begins in infection of the host and execution of the viral payload, and leads to the immune response of the host and the evolution of both host and virus, has many surprising similarities with malware. Concepts such as code injection, evasion and obfuscation exist both in the biological and computer realms. This webinar provides an understanding of each stage in the life cycle of a biological virus, and compares it to the relevant stage in the life cycle of malware. Surprising differences between malware and virus actions will be shown, and some mechanisms which are used by viruses, but have not been adopted, or even attempted by malware, will be revealed. Threat actors are constantly searching for new and sophisticated ways in which to avoid detection in order to successfully perform malicious attacks. During the past year there has been an extreme increase in the amount of fileless malware attacks. Fileless malware attacks pose a threat to organizations and a challenge for security vendors, due to the use of various nonexecutable file formats for infection, and the ability to execute parts of the malicious logic of the attack in-memory only. This phenomenon has encouraged cyber criminals to more extensively adopt fileless attack techniques, which were once mostly used by nation-states, leading to a rise in the amount of fileless attacks. This webinar will present a comprehensive overview of fileless malware, enabling individuals and organizations to better understand and deal with the threat posed by fileless malware. 2016 has been yet another record breaking year in many aspects of the cyber security and malware world. We will look at some of the trends and vectors that have materialized or strengthened in 2016 and will carry into 2017. Join Shimon N. Oren, Deep Instinct’s Head of Cyber-Intelligence, to learn about the evolution of malware and cyber threats in the previous year. From ransomware, through cross platform campaigns, to file-less attacks we will review and give examples of the newest concepts and campaigns that will shape this year’s play ground between hackers and the cyber-industry. Shimon Noam Oren is the head of Cyber-Intelligence at Deep Instinct. Prior to joining Deep Instinct Shimon served for 14 years as an officer in the Israel Defense Force's elite cyber unit. With a background that includes a wide range of cyber security and intelligence positions, Shimon successfully led multifunctional teams of engineers, analysts, hackers and security professionals in various settings and operations. Some of his other accomplishments during his tenure in the military include developing new methods and tools for researching and analyzing cyber-attacks and leading a product management team in charge of a series of innovative cyber collection products. Shimon has worked extensively with a variety of industry, defense and intelligence partners and agencies in North America and Europe, and was awarded the President of Israel Award for outstanding service. Harnessing the power of deep learning, Deep Instinct is revolutionizing cyber security - Unleashing game-changing threat detection and prevention technology.